Milestones Restaurant (web site, 1109 Hamilton Street, Vancouver, BC, Canada, phone: 604-684-9111) offers contemporary Pacific Northwest cuisine in a trendy, upscale atmosphere. 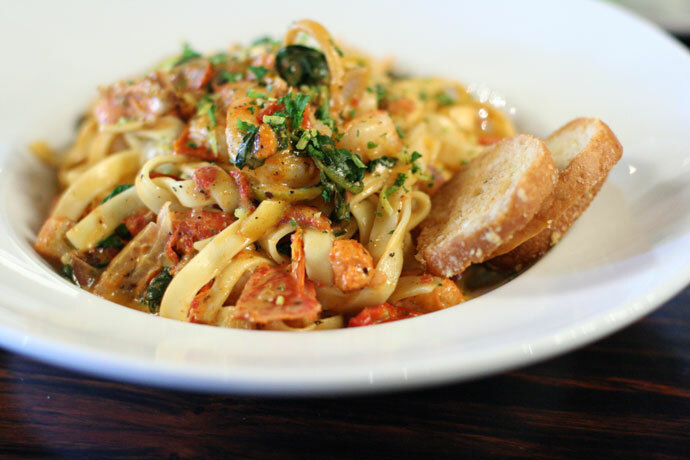 Pictured below is the Seafood Fettucini ($16.99), which was really yummy! More photos: Part 3, Part 2, and Part 1. 13,583 views. This entry was posted on Friday, February 1st, 2008 at 10:05 pm	and is filed under American, Burgers, Casual, Chicken, Creative Dishes, Downtown, Food Photos, Fun atmosphere, Grill, Hamburgers, Large Groups, Lively, Lunch, Modern Decor, Open Late, Pasta, Restaurant, Seafood, Steaks, Trendy, Upscale, Vancouver, Vancouver Restaurants, Yaletown. You can follow any responses to this entry through the RSS 2.0 feed. You can leave a response, or trackback from your own site.